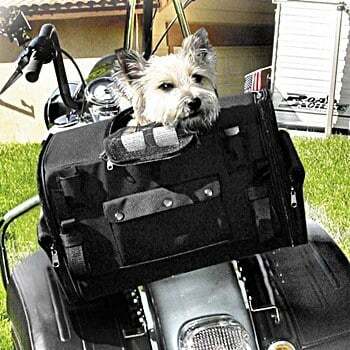 10 Must-Have Features in a Motorcycle Pet Carrier for Dogs! When it comes to our favorite four-legged friends, we often want to take them everywhere we go. If you love riding your motorcycle as much as you love your dog, why not combine both? Now, you can take your dog safely along with you. 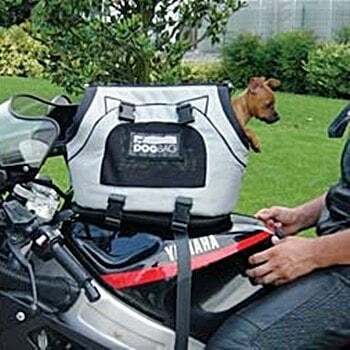 There are plenty of good motorcycle pet carriers for dogs. This makes it easier than ever to make sure you never have to be without your companion. Making sure that you choose the right carrier is important for your peace of mind, and for the safety of your pet. Carriers should be fun, but also functional. Let’s explore some of the most important features. Finding the right pet carrier for your dog to come with you on your motorcycle trips needs research. With that being said, you have to know what you need. There are certain features every quality pet carrier should have. While it can be exciting, bringing your dog along with you on your bike, it can also be a little scary if you have a lesser-quality carrier. So, when you’re searching for the perfect pet carrier for your canine companion, consider the following features. It’s extremely important for your pet carrier to be durable in almost all conditions, such as the Kuryakyn 4199 Pet Palace Bag. This covers everything from being made with strong materials, to be able to hold up against the happenings of the road. You want your carrier not only to withstand being moved around a lot but to be able to hold up to weather. Choosing a carrier that is water resistant, like the Kuryakyn 4199 Pet Palace Bag, will help to protect your pet against rain, and other problematic weather. Most reliable pet carriers are made of heavy-duty plastic, and some are even reinforced with aluminum. One of the biggest concerns motorcyclists can have when it comes to a great pet carrier is the door. Some bags have several openings, including top windows that allow your dog to stick it’s head out and enjoy the open road. But, when you want your pet to be safe and secure, it’s important to know that all of the openings are secure and locked. Also, you should make sure it’s not possible for your dog to accidentally unlock anything from the inside of the carrier. Because most pet carriers are made from strong, sturdy materials, there can sometimes be interior hazards. Screws or staples that can ‘poke’ through can be dangerous to your pet. When you’re looking for a functional carrier, choose something that’s durable and strong, but is designed with your pet’s safety in mind. They actually spend time in it, like the Petego Universal Sport Bag. One sleek, seamless design allows your pet to be comfortable, and safe from any dangerous poking when they’re in the carrier. Don’t be afraid to check the interior of the carrier yourself once you purchase one, to see if there are any avoidable hazards. Any screws or staples that may be poking through should be covered as well as possible. Even if a carrier is waterproof, leaking can be a completely different issue. Sometimes, your dog might get scared, or restless within the carrier, and have an accident. You want to make sure that any liquids within the carrier stay there until you can stop and get everything cleaned out. A pet carrier that leaks can not only be irritating, as it can leak onto your bike or belongings, but it can cause damage to the fabric over time. This could eventually wear it out, decreasing the lifespan of the carrier itself. Plus, any foul smells are likely to stick around once they seep into the actual fabric. While you don’t want leaks to occur, you also probably don’t want your dog to have to sit or lay in any accidents they may have. Pooling and puddles aren’t appealing for anyone, including your canine friend. So, choosing a carrier that advertises absorbent material on the floor of the bag is a smart way to go. An absorbent material will soak up any accidents and can allow your dog to at least be comfortable until you have time to get everything cleaned up. Another option to consider is a ‘removable’ floor or a carrier with a floor liner. This makes it easy to take out the soiled area and clean it. If your carrier doesn’t have a removable floor or liner, chances are you’ll have to clean the whole bag, which can be much more of a chore. Try making cleanup as easy as possible for yourself. This may seem obvious, but not all pet carriers for motorcycles are created equally when it comes to the best ventilation. Whether you’re on the open road, or at a pit stop, you’ll want to ensure that your dog is getting enough ventilation throughout the carrier. This not only helps them to breathe freely and openly but will keep them cool and comfortable. Carriers with multiple flaps, like the Saddlemen Pet Voyager, are usually great options, as they give you the freedom to give your dog as much fresh air as they need. You love the feeling of the wind in your face while you’re riding, so it’s safe to say your dog will, too! Your dog’s comfort level should be one of the biggest considerations when choosing a pet carrier for your motorcycle. Whether you’re taking a short ride or making a long trip, ensuring the comfort of your dog is important for their well-being. The best way to make sure they’re comfortable, as well as safe, is to choose a carrier that they can move in. That doesn’t mean they need to walk around. But, a carrier that allows your dog to stand up and turn around is usually a good rule of thumb as far as adequate space goes. If your dog feels as though they have enough space, they’ll be far more comfortable. While the safety and comfort of your pet should be high priorities, functionality for yourself is important, too. 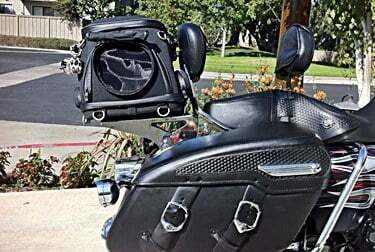 The easier a motorcycle pet carrier is for you to use, the more often you’re likely to use it. For that reason, it’s a good idea to choose a carrier that is easy for you to actually ‘carry’ around – and handles are a great solution for that. Some carriers can even double as backpacks. But, it’s important to have some way actually to move the carrier from place to place easily. Because motorcycle pet carriers are becoming more popular, the ‘additional features’ are becoming more prominent. There are so many carriers available on the market that feature a ton of versatility. This includes everything from carriers that have leashes built in, to carriers with seat harnesses, water bowls, and everything in between. One versatile product that’s worthy of your consideration is the Pet Ego Universal Sports Bag Pet Carrier. Granted, the structure and design of the carrier will always be the most important thing. But, a motorcycle carrier for small dogs can be a bit of an investment. With that in mind, don’t be afraid to indulge your pet with a few bells and whistles. Again, a pet carrier can be an investment. Because there are so many, you’re bound to find a wide range of pricing. While it’s not necessary to choose the most expensive brand, consider what you’re getting for what the price tag reads. Often, the more expensive models are the carriers that have additional features. They are usually safer and sturdier than the ‘cheaper’ designs. Different pet owners want and expect different things from these carriers. So, don’t be afraid to find the one that works for you and your dog. Consider which features stand out most. 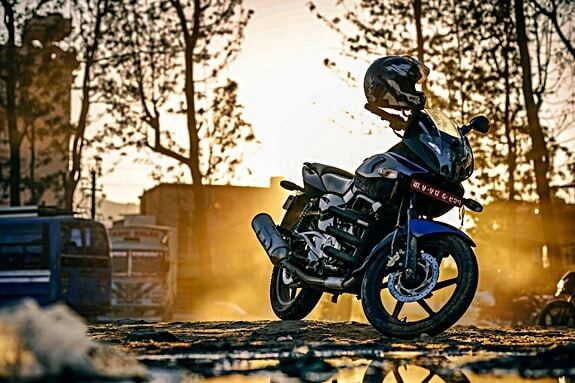 With the right carrier attached to your bike, you and your four-legged friend can start going on some incredible trips.